A404 sliproad to join M4 westbound. Stay on M4 for approx 86 miles before leaving at junction 19 (signposted Bristol M32). Continue on M32 for 3 miles and exit junction 2 (s/p B4469 Fishponds). At roundabout take third exit (s/p A38 Horfield). Keep right on Muller Road until traffic lights. Turn left into Filton Avenue (unsignposted) for the ground. There is a large car park at the ground but this has restrictions on matchdays and street parking is advised but don't leave it too late! Recommended spots are Muller Road and Gloucester Road. Check www.rac.co.uk for specific or more detailed directions. Train: Nearest mainline station Bristol Parkway - approx 2 miles from the ground. Not really convenient from High Wycombe and returning for midweek games isn't an option. The last train from Parkway being 22.00. However, don't let that put you off. Connections via London are from Paddington on the First Great Western Service - journey time approx 1 hour 30 minutes. There are buses from the station to Filton Avenue - look for the No.73. Check www.nationrail.co.uk for specific times and connections of trains. 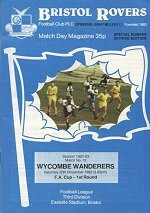 The first competitive match between Wycombe and Bristol Rovers came on Saturday 20th November 1982 when the two sides met at Eastville in the First Round Proper of the FA Cup. Wycombe were leading the Isthmian League at the time, while Rovers, managed by Bobby Gould, were 4th in the old Third Division. Wycombe put up a spirited performance - losing by a single goal. Wycombe defender Mark Hill had a golden opportunity to score but stubbed his shot, much to the dismay of the 1,000 plus travelling Wanderers fans. John Akinde - Striker who spent three months on loan for Wanderers from Bristol City at the end of the 2008/9 season, scoring twice on his debut against Brentford in the 3-3 draw at Griffin Park in March 2009. Went on to score 7 times in 11 apps for Wanderers and returned briefly the following season but scored just once in 6 games during an injury and suspension hit spell. Had a brief loan spell at Brentford in February 2010 before a loan move to Bristol Rovers at the start of the 2010/11 campaign. Formerly with Ebbsfleet before a �140,000 moved to Bristol City in September 2008. Ijah Anderson - Defender who made five appearances on loan to Wycombe from Brentford during the 2002/2003 season. Played on loan at Rovers later that same season before a permanent deal at The Memorial Ground in the summer of 2003. Totalled 55 apppearances for Rovers before switching to Swansea City in November 2004. Angelo Balanta - Made 11 League appearances for Wanderers, scoring three times, while on loan from QPR during the 2008/9 season. Columbian born former trainee with Rangers who made his Football League debut aged 17 in December 2007. Went on to have three loan spells with MK Dons between 2010 and 2013 before a brief loan spell with Yeovil Town at the end of the 2012/13 season. Released by QPR in July 2014 before joining Rovers for their 2014/15 season in the Conference. Scored in the penalty shoot-out victory over Grimsby Town at Wembley in May 2015 before opting to join Carlisle United in June 2015. Scott Bevan - Southampton born goalkeeper who made five appearances on loan at Wycombe while on the books of The Saints. Left Southampton in March 2004 without making a First Team appearance but having played on loan at six clubs. Signed for MK Dons in March 2004 before spells with Kidderminster Harriers, Shrewsbury Town and Torquay United. Moved to Rovers in the summer of 2011 - making 42 League appearances before moving to Havant & Waterlooville for the 2013/14 season. Guy Branston - Defender on loan at Wycombe from Rotherham United during the 2003/4 season - making 9 League appearances under Lawrie Sanchez. The former Leicester City trainee in the late 1990's has a host of other Football League clubs under his CV before moving into non-League football with Kettering Town in February 2008. Spent time at Burton Albion at the start of their promotion season of 2009/10 before moving on loan to Torquay United in the January 2010 transfer window and made the move permanent in the summer of 2010. Moved to Bradford City in the summer of 2011 and made a brief return on loan to The Millers later that season. Signed for Aldershot Town in the summer of 2012 where he made four loan appearances for Rovers in November and December 2012. Spent the 2013/14 season at Plymouth Argyle before retiring from the playing side aged 35. Paris Cowan-Hall - Nippy midfielder who joined Wanderers on a free transfer from Plymouth Argyle in June 2013, making 53 appearances and scoring 11 times before a move to then 'Championship' side Millwall in December 2014 for a fee believed to be in the region of �200,000. Had an injury hit start to his time at Millwall and joined Rovers on an 'emergency one month loan' on 23 November 2015. Lance Cronin - Goalkeeper who made his professional debut, aged 19, against Bristol Rovers during his single loan appearance for Wycombe on the final day of the 2014/15 season while on the books of Crystal Palace. Later made close to 200 appearances for Conference side Ebbsfleet United before spending the 2010/11 season at Gillingham - making 7 League appearances. Joined Rovers in the summer of 2011 but his only League appearance was playing the second-half of the New Year's Eve match against Crewe after first choice Scott Bevan had conceeded four goals in the first half. Later played for Macclesfield Town. Scott Davies - Midfielder who made 23 loan appearances at Wycombe while at Reading. Became Gary Waddock's first signing for Wycombe after taking the job at Adams Park in October 2009 - staying at Adams Park for a three month loan spell and making 15 League apperances. Made 4 loan appearances for Yeovil Town later that same season before returning for a second loan spell with Wycombe in September 2010. Played on loan for Rovers towards the end of the 2010/11 campaign, while still at Reading, making 7 League appearances. Released from Reading at the end of the 2010/11 season and joined Football League newcomers Crawley Town. Jermaine Easter - Scored 28 times for the Wanderers during a two year spell following a move from Stockport County in January 2006. Moved to Plymouth Argyle from Wycombe in a �215,000 deal in January 2008 but failed to make an impact at Home Park and eventually moved to MK Dons in the summer of 2009 following loans spells with Millwall and Colchester United. Scored 8 goals in 55 League appearances in a two year spell with Crystal Palace before joining Millwall on a permanent basis in May 2013 following an earlier loan spell. Signed for Rovers in January 2015 and part of the team that gained promotion back to the Football League in May 2015. Mark Foran - Defender who had spent an unspectacular loan spell from Sheffield United at Wycombe at the start of the 1995/96 season under Alan Smith. Moved to Peterborough United in February 1996 for a �30,000 fee and joined Crewe in December 1997 for �45,000. Transfered to Rovers in the summer of 2000 for �75,000 and made 54 appearances during a two year spell. Moved to Telford United and then Northwich Victoria in the latter part of his career. Paul Hardyman - Left back who played more than 100 times for Portsmouth between 1983 and 1989. Went on to play for Sunderland before moving to Rovers in 1992 - making 67 League appearances in a three year spell. Became Alan Smith's first signing as Wycombe Manager at the start of the 1995/96 season when he signed from Rovers - going on to make 15 League appearances. Finished his playing career at Barnet and then had a spell as Youth Team Coach at Portsmouth. Played in the 1992 FA Cup Final as substitute for Sunderland when they lost to Liverpool. Matt Harrold - Striker who signed for Wycombe from Southend United in September 2008 for a �10,000 fee. Had spent two years with The Shrimpers following a previous spell with Yeovil Town. Originally a trainee with Southend but broke into professional through Brentford in 2003. While at Brentford, also spent time on loan at Dagenham & Redbridge and Grimsby Town. Released by Wycombe in May 2011 after scoring 22 goals in 75 appearances. Spent a season at Shrewsbury Town before moving to Rovers in the summer of 2011. Scored 27 League goals in 76 appearances before moving to Crawley Town in the summer of 2014. Joe Jacobson - Defender and former youngster with Cardiff City who joined Rovers on a permanent basis in the summer of 2007 following an earlier loan spell. Made 84 First Team apps for Rovers before time with Oldham Athletic and then Accrington Stanley. Spent three seasons with Shrewsbury Town before his move to Wanderers in the summer of 2014 where he immediately became a regular - making 50 First Team apps in his season at Adams Park. David McCracken - Glasgow born Defender who was brought to Wycombe by Paul Lambert from Dundee United in July 2007. Made 82 appearances for Wycombe in a two year spell but left at the end of the 2008/9 season, despite Wycombe's promotion from 'League Two', in favour of joining MK Dons. Spent a season with 'Franchise' before signing a two year deal at Brentford but after only two starts for The Bees, joined Rovers on loan in January 2011 - making ten appearances before the end of the season. Left Brentford by mutual consent in May 2011 by 'mutual consent' and went on to play in Scotland for St.Johnstone and Falkirk. Scott McGleish - Well travelled and prolific striker who joined Wycombe from Northampton Town in January 2007 having scored 42 times in the League in 111 appearances in a 2 and a half year spell. Scored 34 times for Wycombe in 75 appearances before falling out of favourwith new Manager Peter Taylor and eventually being loaned back to Northampton at the end of 2008. Released by Wycombe in May 2009 and joined Leyton Orient shortly afterwards. Scored 24 League goals in two years at Orient before switching to Bristol Rovers in the summer of 2011, going on to score 7 goals in 27 apps before continuing his personal club tour by returning to his former club Barnet on loan and then into non-League football with Whitehawk, Chesham United, Enfield Town and Wealdstone. Brian Parkin - Former Rovers 'keeper who never hit it off at Wycombe under Alan Smith or John Gregory. Returned to Rovers as stand in stickman and coach in 1999 and went on to play for Team Bath at the tail end of his career. Originally an apprentice with Oldham Athletic before time with Crewe, Crystal Palace and then a seven year spell with Rovers, making close to 300 appearances. Jo Kuffour - Striker who scored 32 League goals for Rovers in 130 appearances during a four year spell following a move from Bournemouth in August 2008. A former Arsenal trainee who played made his senior debut while on loan at Swindon Town from The Gunners. Later played for Torquay United and Brentford before a year with Bournemouth. Spent time on loan at Gillingham during the 2011/12 season while with Rovers, with the deal eventually being made permament. Signed for Wanderers by Gary Waddock in August 2012 - scoring 5 goals in 56 League appearances before his release in May 2014. Andy Rammell - Made his full Football League debut with Barnsley in 1990 after being released by Manchester United. Joined Wycombe in September 2000 for �75,000 from Walsall. Released by Wycombe in March 2003 and joined Rovers on a free. Made 12 League appearances for Rovers - scoring 6 times before quitting the full-time game in the summer of 2004 aged 37. Andy Sandell - Defender who made his Football League while with Rovers on the opening day of the 2006/7 season. Made 36 League appearances but left at start of the following season after Rovers' promotion through the League Two play-offs. Played for Salisbury City and then Aldershot Town from who he joined Wycombe from in the summer of 2010. Made 48 apperances for Wanderers in a 17 month spell and scored 7 times for Wycombe as part of the squad that gained promotion back to 'League One' at the end of the 2010/11 season. However, became unsettled the following season and was loaned to Forest Green Rovers before leaving with 'mutual consent' in November 2011. Joined Newport County in January 2012 following a short spell with Chippenham Town. Part of the County side that won promotion to the Football League via a Play-off Final at Wembley in May 2013. Danny Senda - Former Wanderers youngster picked up from the Southampton accademy who progressed through the ranks at Adams Park - making his First Team debut in March 1999 aged 17. Went on to rake up over 300 apps for Wycombe before eventually opting to join Millwall in the summer of 2006 rather than signing a new deal at Adams Park. A regular for Millwall for two seasons before a serious injury in May 2008 curtailed his career. Released by Millwall in the summer of 2009 before Torquay United offered him a short term deal in September 2010 where he continued to try and prove his fitness. Scott Shearer - Goalkeeper who signed for Wycombe on a free from Rovers in the summer of 2007. Formerly with Albion Rovers and Coventry City before signing for Rovers in the summer of 2005. Initially a regular in the Rovers side before falling out of favour and ending the 2006/2007 season on loan to Shrewsbury Town. Simon Stapleton - 'Stapes' was at Rovers in the 1980's before a successful spell at Wycombe between 1989 and 1996 where he was part of the Wycombe squad that won promotion to the Football League and reached two FA Trophy finals under Martin O'Neill. Totalled 269 appearances for Wycombe. Andy Thomson - Central defender began his pro career with Swindon Town before moving on to Rovers following a spell at Portsmouth. Joined Wycombe on free towards the end of the 2001/2002 but was released during the Tony Adams era. James Tunnicliffe - A former Stockport County youth team product who played on loan with Rovers during the 2010/11 season while on the books of Brighton. Signed on a one year deal by Gary Waddock on a free from Brighton in June 2011. Debuted for Wanderers on the opening day of the 2011/12 season and scored but would eventually fall out of favour with Waddock and was eventually released in May 2012 having made 20 appearances. Richard Walker - Spent three months on loan at Wycombe from Aston Villa during the early part of the 2001/2 season. Scored four goals in eleven appearances for Wanderers before opting to join Blackpool on a permanent basis in preference to Wycombe. Spent three months on loan to Northampton Town during the 2003/4 season and later that season also appeared on loan for Oxford United. Joined Bristol Rovers on a free in the summer of 2004. Spent time on loan at Shrewsbury Town during the 2008/9 season before switching to Football League newcomers Burton Albion in the summer of 2009. Chris Zebroski - A prolific scorer for Torquay United in two spells. Originally made his Football League debut for Plymouth Argyle in 2005 before a move to Milwall where he was first loaned to Oxford United and then to Torquay for the whole of the 2007/8 season. Netted 18 Conference goals and prompted then Wycombe Manager Peter Taylor to sign him following his release from Millwall in the summer of 2008. Scored a relatively disappointing 9 goals in 55 apps for Wycombe before returning to The Gulls in November 2009 on loan and then permanently in the January 2010 transfer window. Moved to Rovers in the summer of 2011. Also: Chris Carruthers - Signed a two year deal with Wycombe in June 2005 following a free transfer from Northampton Town but the player had a last minute change of mind and opted to join Rovers instead with even playing a game for Wanderers. Went on to become a regular with The Gas before switching to Oxford United in the summer of 2008. Charlie Griffin - Former Youth Team player with Rovers but released in 1998 aged 18 without making a First Team appearance. Spent time with Chippenham Town and spell in the Football League with Swindon Town before dropping down to non-League. Spent an injury hit 18 months at Wycombe after joining from Forest Green Rovers in May 2005. Loaned back to Forest Green at the start of the 2006/7 campaign before being released in January 2007 and going on to join Newport County. Bagged 26 goals in 49 apps for County and then more than 20 for Salisbury City during the 2008/9 season before signing for Stevenage on a free transfer in May 2009. Scored 16 times for Borough in the season they gained promotion to the Football League. Jason Roberts Striker who played for The Wanderers Youth Team in the mid 1990's before ending up at Rovers via Wolves. Jamal Easter - Cousin of former Wanderer Jermaine Easter, made four appearances for Rovers on loan from Cardiff City in late 2006. Had a brief trial with Wycombe during the pre-season games for 2007/2008. Paul Buckle - Played briefly on loan in the Conference with Wycombe during the 1992/93 season while on the books of Brentford. Became Rovers Manager in May 2011 after four years with Torquay United.